To the casual observer, the world of fly fishing may look like a totally male-dominated endeavor. Dig a little deeper, however, and you will inevitably discover the long-held and enduring legacy that female anglers have imprinted on the sport. It was Joan Wulff who changed the sport forever. In 1943, at the age of sixteen, she walked away with top honors in the national dry fly accuracy championship. From there she would go on to rack up twenty-one additional casting titles before ultimately winning the National Fisherman’s Distance Fly Championship with a cast of 136 feet against a field of all male competitors. By the early 1950s, a time when women’s rights were severely limited, Joan Wulff was widely regarded as the best fly caster in the world. Wulff used her deep knowledge and innate understanding of fly fishing and techniques to become one of the single most recognizable figures in the professional fly fishing game. At age 89, Wulff is still heavily involved in the art she mastered many years ago, mainly through teaching and inspiring both male and female anglers alike. In the wake of her success, increasing numbers of women have found avenues into the historically male-dominated sport. 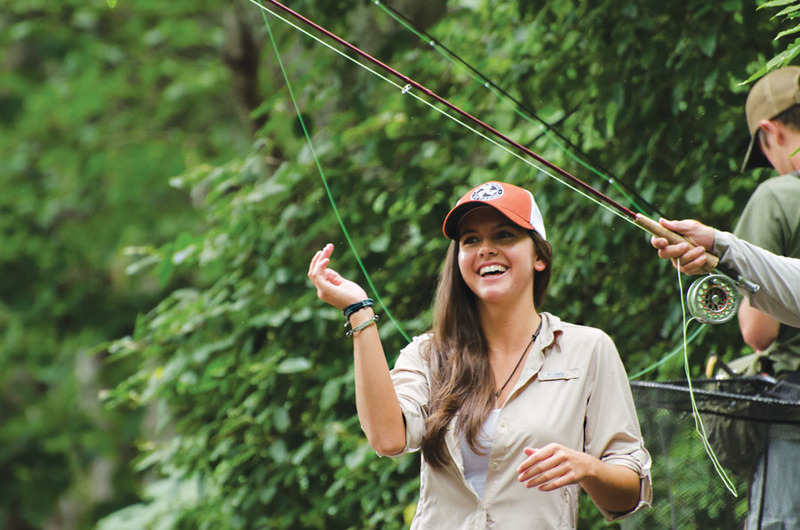 Today, fly fishing is experiencing a golden age of female participants. Here are a few of the many female anglers making waves right here in the Blue Ridge and around the country. Katie Cahn grew up fishing the foothills of the Blue Ridge Mountains near the border of North and South Carolina on land settled by her family in the 1800s. 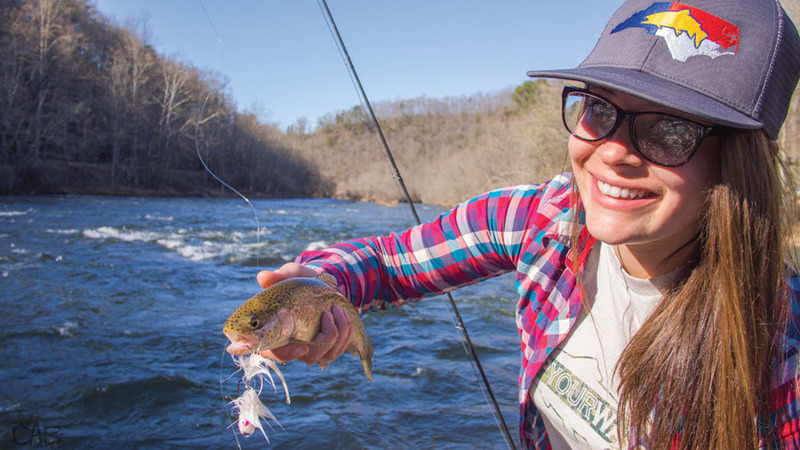 Katie didn’t discover what would become a lifelong love of fly fishing until her college years at Western Carolina University. It took time, but with focus, perseverance and a little bit of mentoring, Katie soon became a highly proficient angler. She advises other would-be female anglers to stick with the sport, even if barriers to entry like expensive gear and the long learning curve get in the way. “Fly fishing takes patience, and the more you do it, the better you get. It’s an expensive sport, so borrow or rent gear in the beginning until you know it’s what you want to do for years to come. If you can, try to get into a women’s flyfishing group around your area. Cassie Spurling began fly fishing at age five in the mountains of North Georgia, which she still calls home today. Under the tutelage of her father, she learned the ins and outs of what would one day become a full-time obsession. 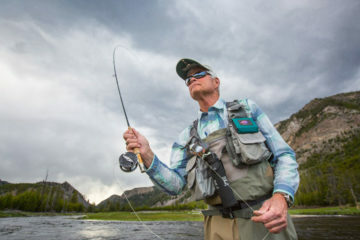 “My father is one of the most impactful inspirations I’ve had in my flyfishing journey,” Spurling says. “I remember being frustrated when I was first learning as I watched him effortlessly present a fly to unsuspecting trout. 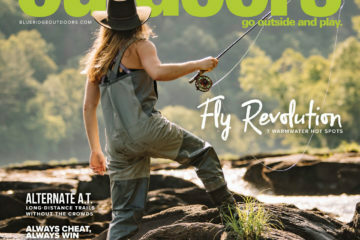 I wanted to cast as well as him.” Over the years, as Cassie continued to pursue her passion for all things trout, she eventually took her skills to the next level, and a premier North Georgia guiding outfit took notice. Jen Ripple learned to to fly fish on the banks of the Huron River not far from the campus of the University of Michigan, her employer at the time. Before long, Jen was obsessed. A few years later, when Ripple left Ann Arbor for Chicago, she immediately got involved with a fly tying class at a local rod builder and fly shop in the city. She continued to write the column for about three months but eventually grew restless. From that conversation, Dun Magazine—a publication that showcases female anglers from around the globe—was born. Now Jen does work for Dun from her home base in Dover, Tennessee where her backyard is adjacent to 178,000 acres of public land known as the Land Between the Lakes. You may know Abbi Bagwell from her popular series, #somestreamerchick, where she demonstrates the finer points of fishing with a category of flies known as streamers. Like Cahn, Abbi grew up fishing, but she didn’t begin swinging a fly until later in life. “It wasn’t until I graduated from Brevard College that I would find my passion and love for fly fishing,” she said. She landed a job with Flymen Fishing Company, a company that manufactures fly tying materials. Over the course of her tenure with Flymen, Abbi broadened her fly fishing knowledge and experience considerably. While she loves fly fishing and devotes much of her life to it, Abbi is well aware of the challenges female anglers face, particularly when breaking into the sport for the first time. She says her father was her biggest inspiration for overcoming these hurdles. Today, Abbi is guiding for Headwaters Outfitters in Rosman, North Carolina. A resident of Falls Church, Virginia, Kathleen ‘Kiki’ Galvin has been fishing for over 50 years. 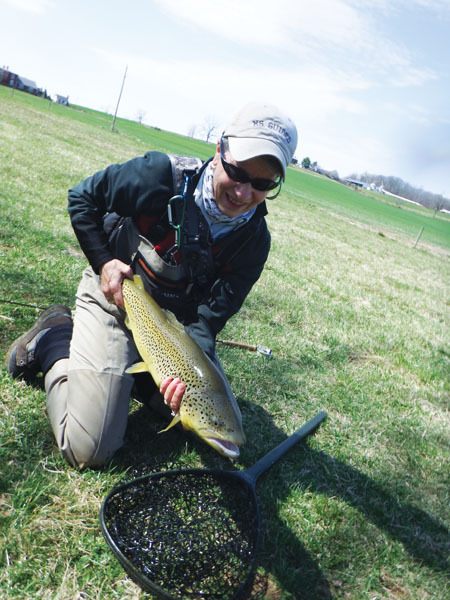 Her fondness for fly fishing emerged in 1996 when she enrolled in a one-day course in Leesburg, Virginia. Since then she’s gone on to become a reputable Virginia fly fishing guide, with her own outfitting service called Ms. Guided Fly Fishing. She also volunteers for Project Healing Waters and Casting for Recovery and serves as the Vice President of her local Trout Unlimited Chapter. According to Kiki, right now is one of the best times to be a female in the fly fishing industry. When introducing new clients to the sport of fly fishing, Kiki likes to employ a technique known as Tenkara. Tenkara, which originated in Japan, employs a much simpler and more approachable method involving only a rod, line and a single fly. The minimal nature of Tenkara makes it a perfect alternative for the type of small, rhododendron-choked streams that Galvin fishes with regularity. Simons Welter—a resident of Spartanburg, South Carolina—has been enamored with the sport of fly fishing for over twelve years. When she’s not guiding for Brookings, Simons spends much of her spare time mining the rivers and streams of Western North Carolina and Upstate South Carolina for wily brook, brown, and rainbow trout. 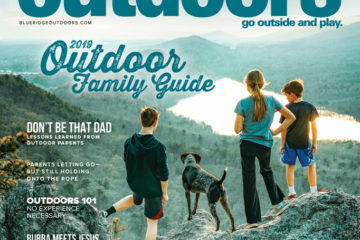 One of her favorite rivers to fish today is the same one she learned to fly fish more than a decade ago—the Chattooga River as it flows through South Carolina. 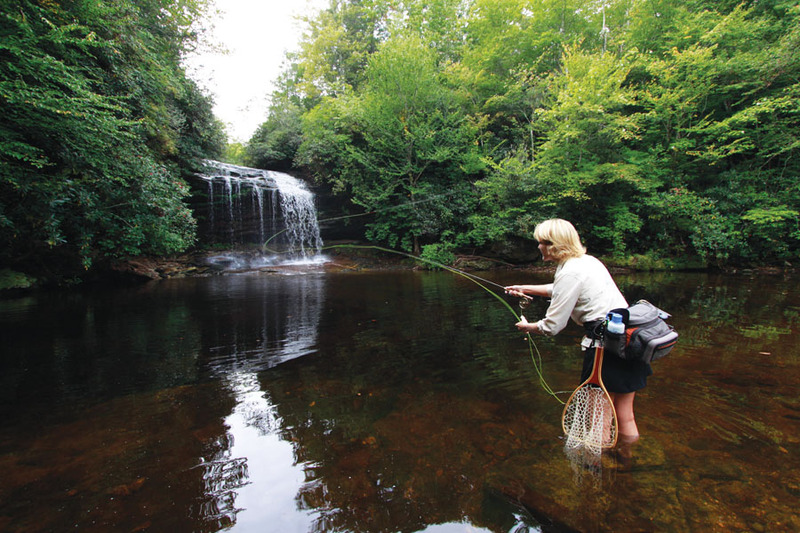 Aside from the Chattooga, Simons does most of her fishing in Western North Carolina. She says that, while breaking into the fly fishing world as a female was challenging at times, it has been an overwhelmingly positive experience. Simons is a 12-year member of the Mountain Bridge Chapter of Trout Unlimited and sits on the Board of Directors for Casting Carolinas, an organization that combines fly fishing instruction and free retreats with medical education and support for women surviving cancer. Hilary Hutcheson likes to tell people that she’s a product of the National Park Service. Growing up in government housing near the west entrance of Montana’s Glacier National Park, where her father worked as a ranger for the NPS, Hilary was afforded opportunities to interact with the natural world that most kids only dream of. By age fourteen, Hilary had landed a gig with Glacier Angler in her home town of West Glacier, Montana, and by 17 she was guiding fly fishing excursions. After high school she left Glacier to attend the college in Missoula where she continued guiding while earning a degree in broadcast journalism on the side. The degree lead to a television news anchor position in Missoula and then to one in Portland, Oregon, before the world famous rivers of the Treasure State beckoned her home again. Once back in Montana, she worked to create an outdoor marketing firm, Outside Media, and a network television show called Trout TV, which she now hosts. Born and raised in the shadow of the Northern Rockies in Chilliwack, British Columbia, April Vokey has been fishing in one capacity or another for most of her life. It was an excitement that would eventually lead her to discover fly fishing, particularly the variety that involves spey casting to giant Steelhead in the waters of British Columbia, at the early age of 18. 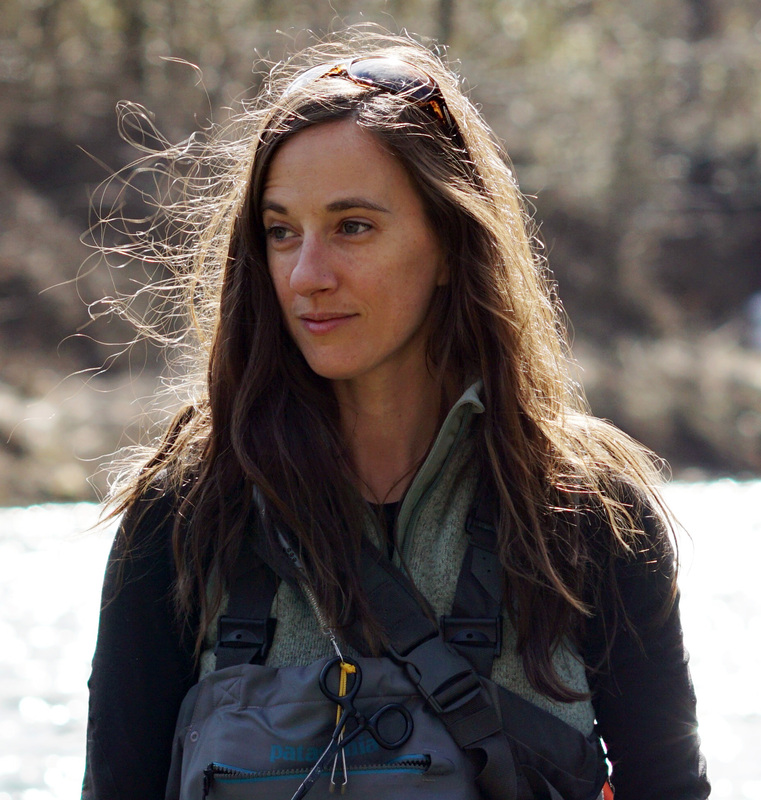 By the age of 23, she would own her own guiding service specializing in Steelhead trips on B.C.’s famed Skeena River, and in 2011 April joined the Patagonia ambassador team, where she now assists in the design and direction of an upcoming women’s line of fishing apparel. 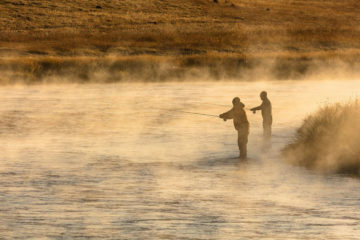 “It has always been a shame to me that fly fishing is perceived as a man’s sport. 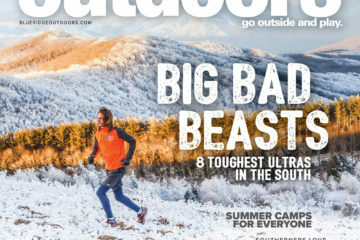 There is truly nothing overly masculine about it,” she said in a 2012 Q & A with Fly Life Magazine. 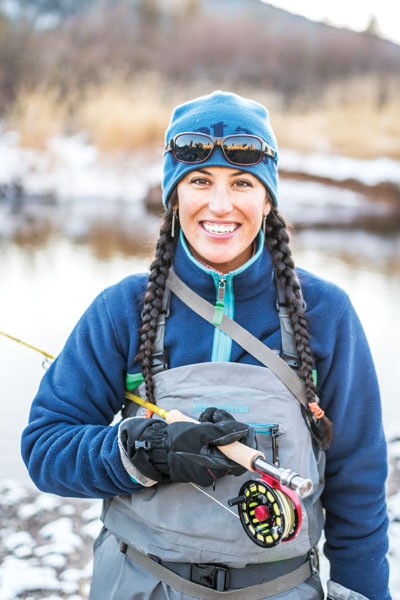 Today April hosts a popular fly fishing podcast called Anchored with April Vokey where she interviews some of the most influential people in the fly fishing game. 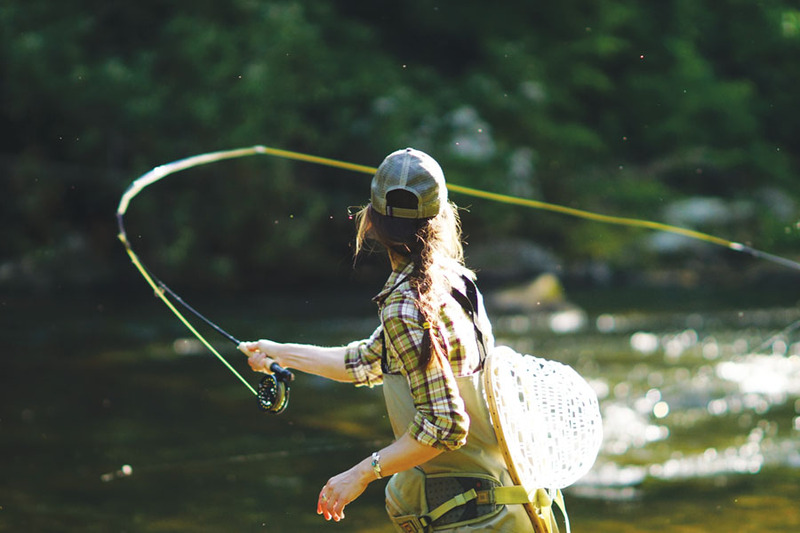 In a recent episode of her podcast, April sat down with fly fishing legend and pioneer Joan Wulff to bring the female fly fishing revolution full circle. 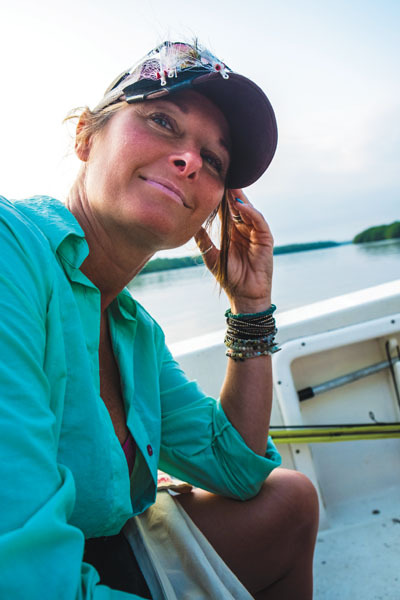 Wulff launched the female fishing revolution over 70 years ago, and now it’s innovative industry leaders like April Vokey who are inspiring a new generation of women to wade out into new waters.